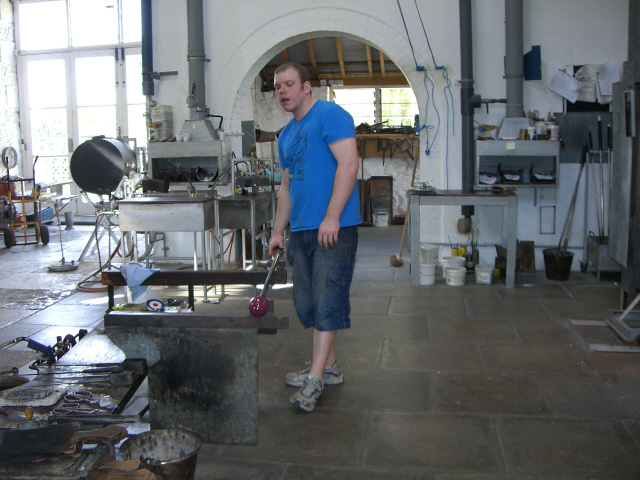 This page will be used to document some of the history of Isle of Wight Studio Glass. 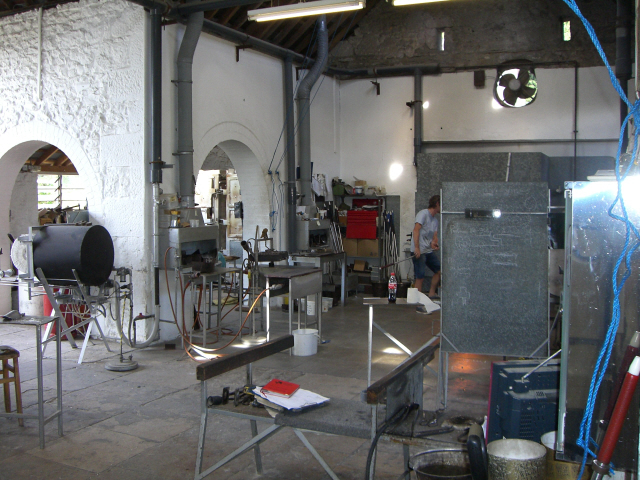 The front entrance to the studio at St. Lawrence in 2001. Image courtesy of IOWSG. The following pictures were taken in September 2012. 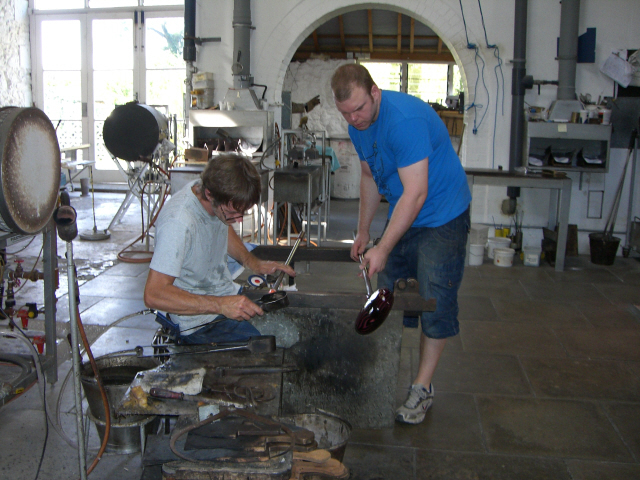 Timothy Harris making a commissioned lollipop vase assisted by Perron 'Reggie' Phipps. 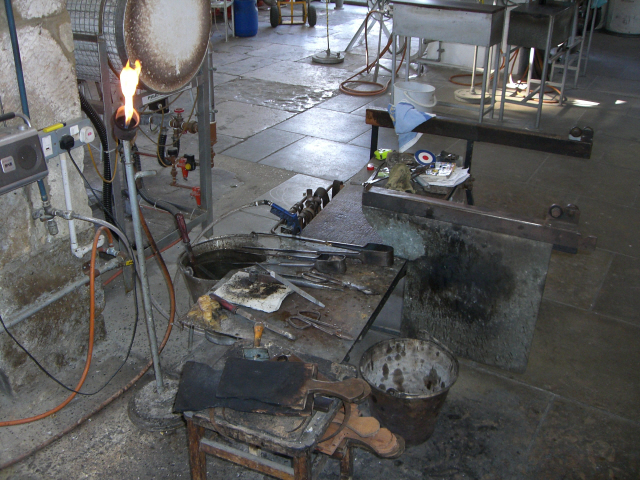 Glassmaking work station with glassmaking tools. 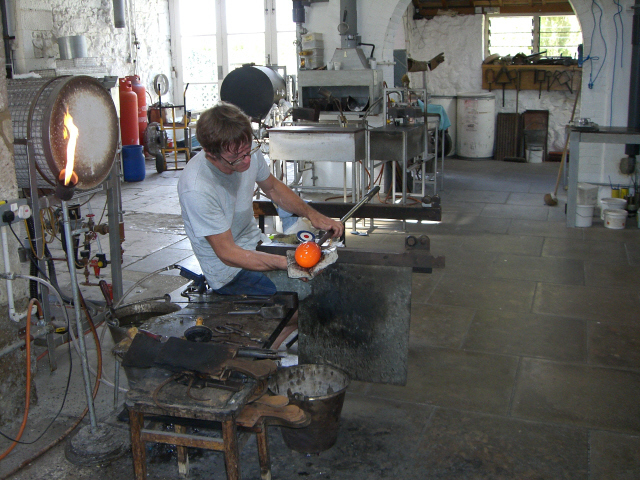 Reggie fetching an initial gather of glass from the furnace. 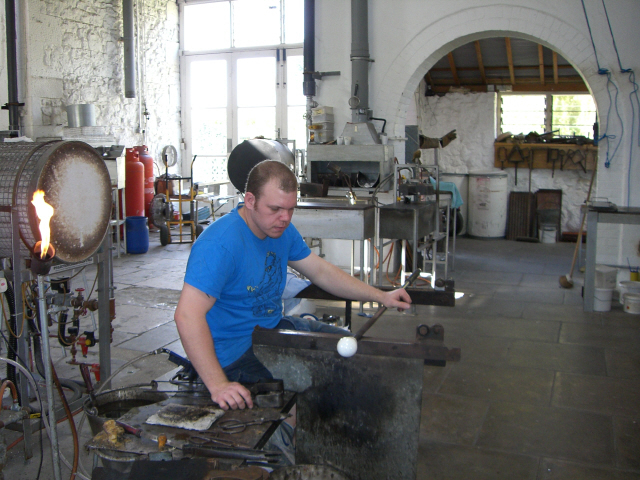 This is the white glass for the interior of the vase. 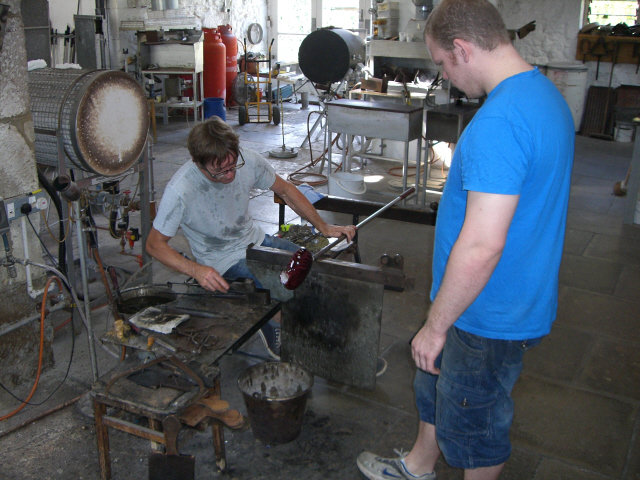 The pink glass has now been added. 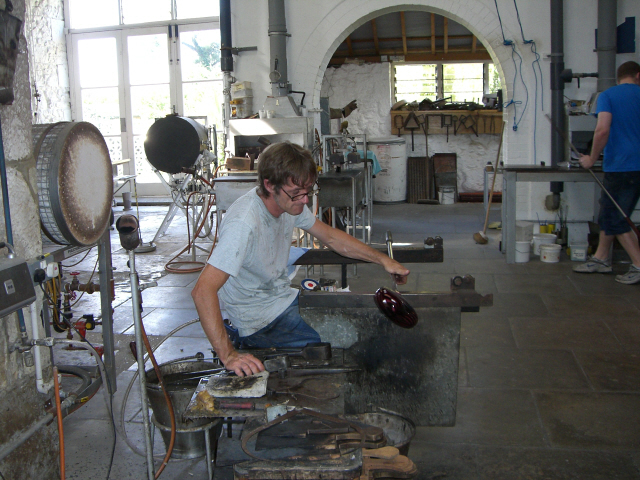 Timothy Harris shaping the reheated gather of glass using a wad of damp newspapers. 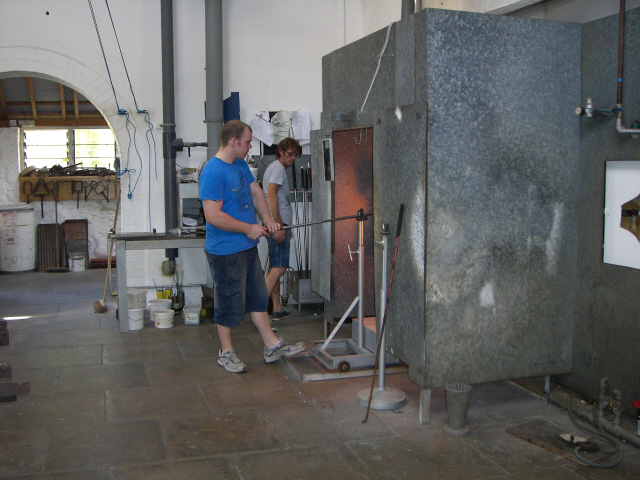 Notice how the glass has cooled down since the previous picture. Adding the black colour in a spiral round the gather. Using a hooked gouge to create the feathered effect on the side of the gather. Timothy is constantly checking progress to make sure everything is going well. 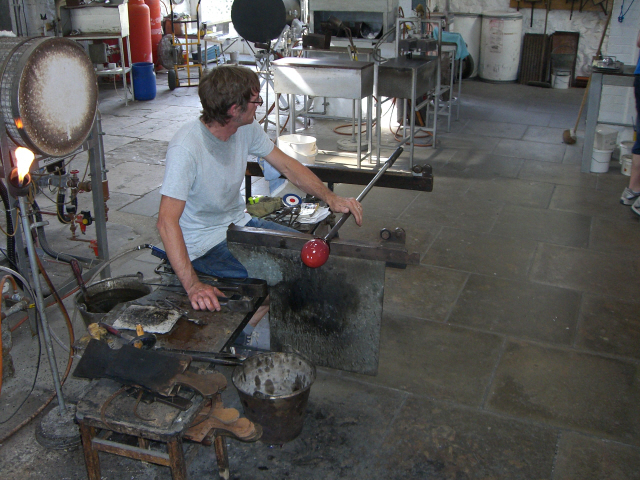 Reggie is about to blow into the tube to introduce air to enlarge the piece and make the lollipop shape. 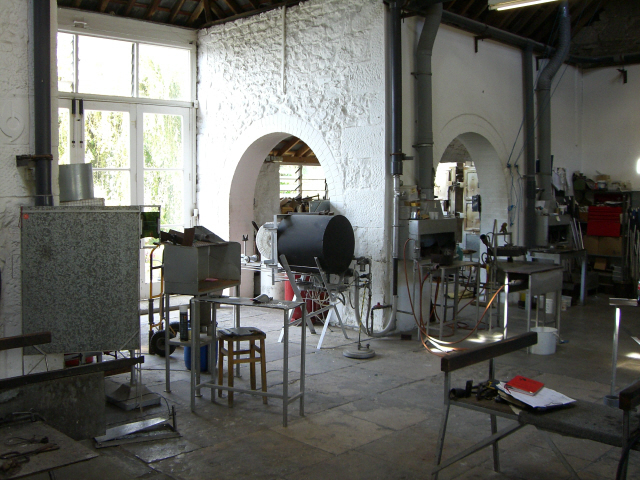 Equipment at the back of the studio. 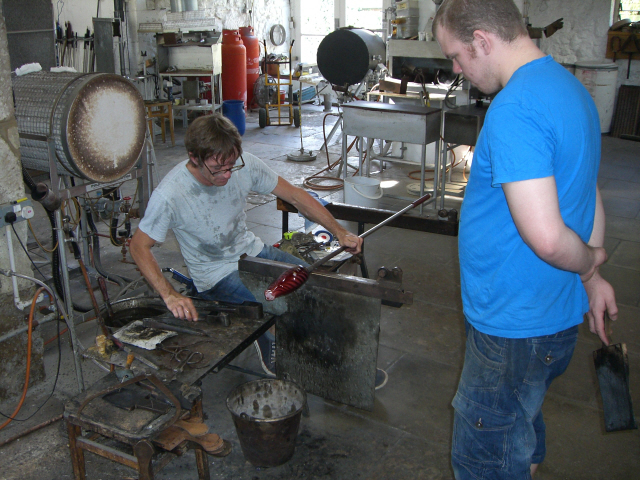 Timothy has flattened the sides of the lollipop vase by pressing it against a metal table. 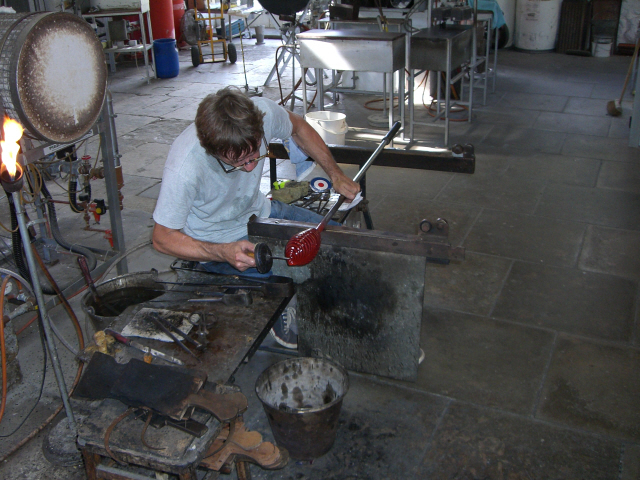 Preparing to transfer the piece to another steel rod and then detaching the piece from the first rod. 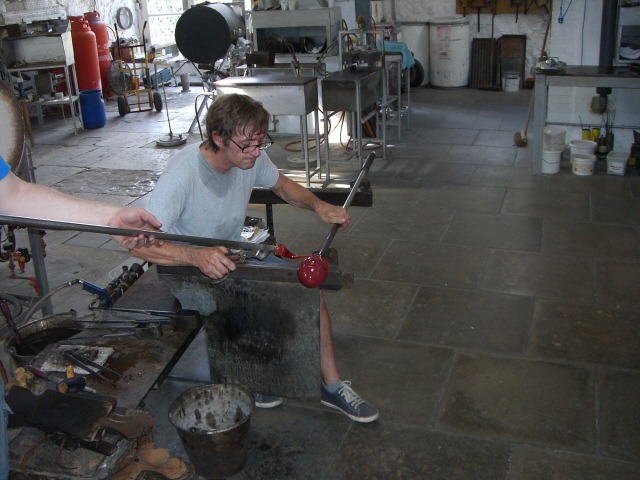 This allows for forming the opening of the vase at the other end. 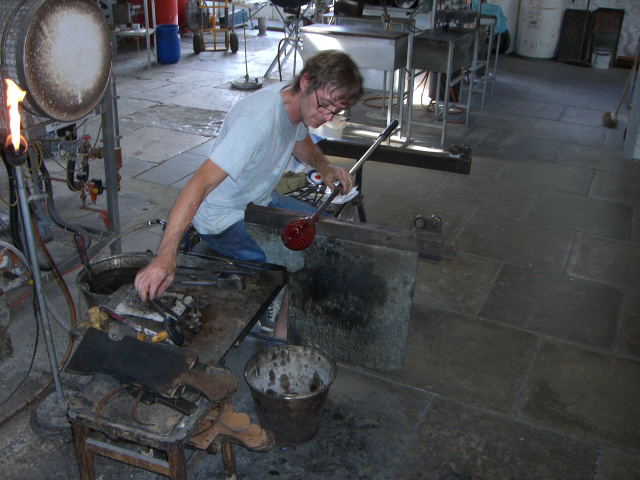 Reheating the lollipop vase before starting to form the vase opening. Shaping the lollipop vase opening. 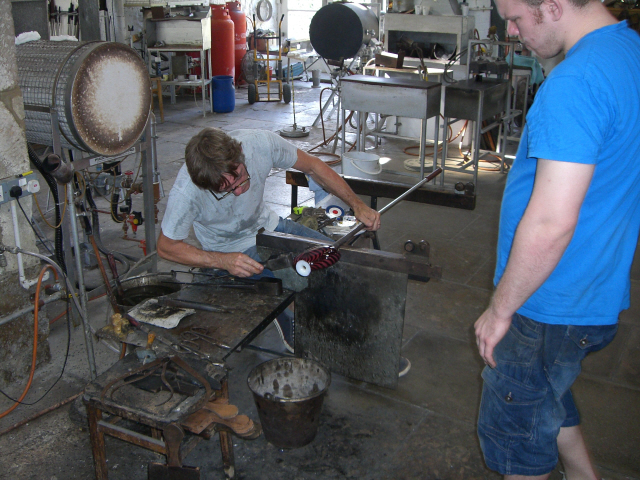 The lollipop vase is nearing completion after about an hour of work. Well done Tim and Reggie! 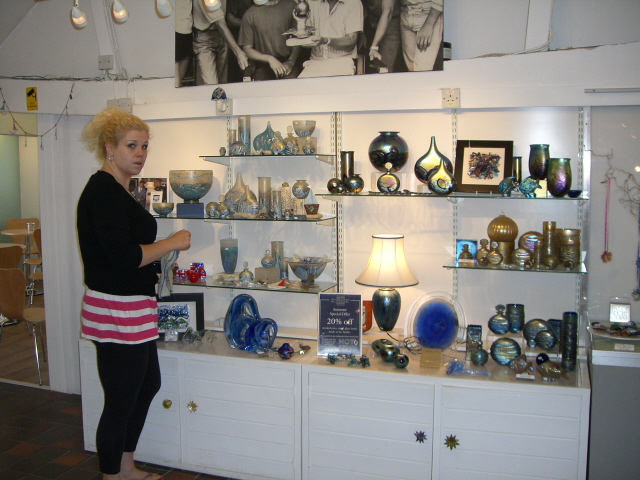 Top left: Seascape vases. 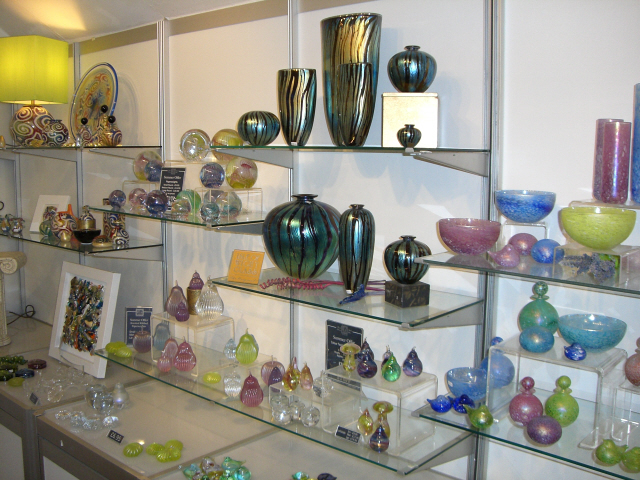 Bottom left: Free-form glass sculptures. Top right: Nightscape vases and perfume bottle. Bottom right: Night Sea, gold above and blue below. Blue Crizzle incalmo plate on the bottom shelf. Elizabeth Harris Picture on top shelf, right hand side. Top left: Jazzy, with Jazzy incalmo plate. Bottom left: Elizabeth Harris Glass Picture. 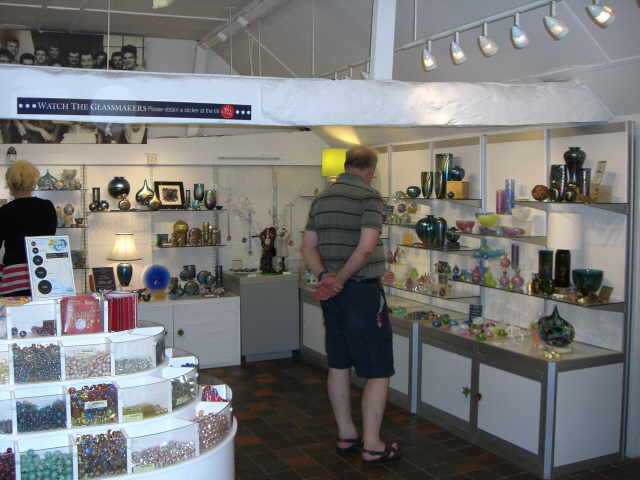 Top centre: Zig Zag vases. Right hand side: various pieces of Summer Garden. 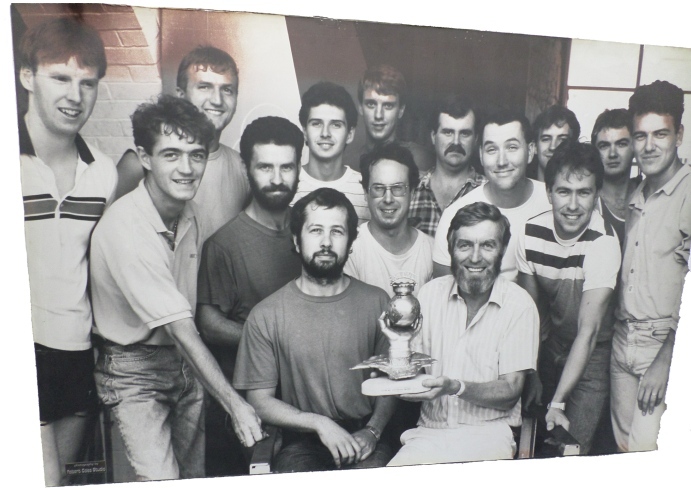 This picture was taken to mark the occasion when the studio received the British Export Award in 1988. Michael Harris is holding the award aloft. Timothy Harris is second left. 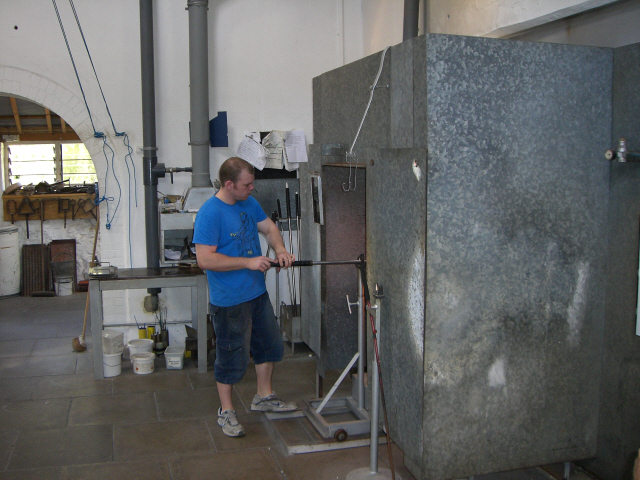 Back row left to right: Ian McCulloch (glassblower), Mark Dennington (cold worker-grinder), Gonique Hol (assistant glassmaker), Giulano Pinzan (assistant glassmaker), Keith Pollard (glassblower), Martli Jansen van Rensburg (assistant glassmaker), Heather Mitchell (assistant glassmaker), Peter Riley (glassblower). 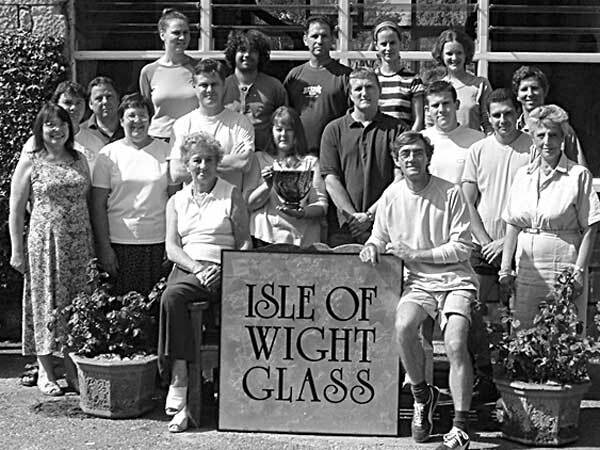 Middle row left to right: Janet Widger (accounts manager), Jo Silvester (company secretary), Steve Cherry (packing room manager), Claire Hockingde-Noffki (assistant glassmaker), David Tolley (graphics-artwork manager), Philip Sharrocks (packing room assistant), Chris Lucas (glassblower), Marlene Bristow (shop assistant). 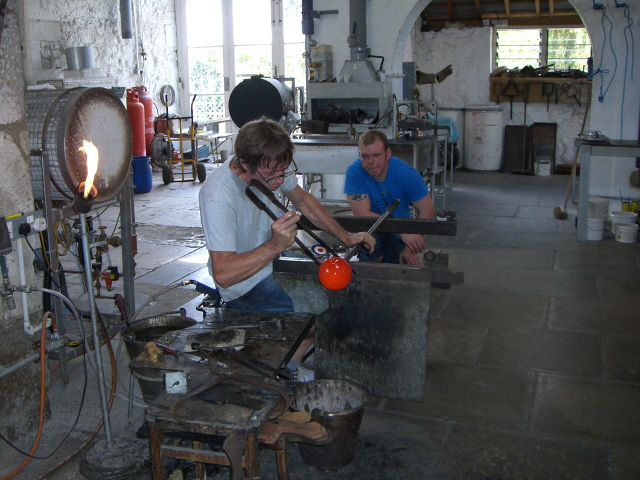 Front row left to right: Elizabeth Harris (senior director), Timothy Harris (managing director-head glassblower). Image and caption courtesy of IOWSG.